Thanks to a combined effort of a number of supporters, volunteers and members of staff, football was finally back on the agenda for the Spitfires after the recent bout of torrid weather. It was over two weeks ago since our last game due to postponements, and today Eastleigh were looking to build on the comprehensive 5-0 demolition job over Billericay Town at the Silverlake Stadium in early January. Richard Hill was able to finally hand centre back Chris Todd his Eastleigh debut having signed from Forest Green Rovers just a couple of days after the win over Billericay. The experienced Todd was bedded in to the defence alongside fellow new signing Dean Beckwith and loanee Alex Lacey (who were both making their second appearances for the club). Hill set out his Eastleigh side with a solid defensive look about it playing a trio of centre halves, who were flanked by Mitchell Nelson on the right and Michael Green on the left. The five-strong unit at the back, six including goalkeeper Jack Dovey, provided the solidarity and foundation of the team. Mark Hughes and captain Glen Southam held the midfield together with Craig McAllister operating as the target man and outlet for the team. Flair players Jai Reason and Damian Scannell were given the freedom to roam in offensive positions. Width was provided from Nelson and Green who were playing as wing backs essentially - defending first and foremost but getting forward when Eastleigh were on the attack. Today's visitors Farnborough were forced into defending early on as Damian Scannell made a good run and drew a foul from Alan Inns, which was penalised with a yellow card in the opening stages. An early corner for Eastleigh saw Jai Reason's delivery pick out Mark Hughes on the edge of the area, though the former Barnet captain saw his shot well charged down. With six minutes played, Craig McAllister headed the ball behind his own goal for a Farnborough corner kick as he came back to help defend a set piece. At the opposite end of the pitch, Michael Green whipped in a cross from the left that saw goalkeeper Jamie Norris come a long way off his line. Norris was under pressure from Reason who was backing in to the keeper in an attempt to challenge for the ball, which saw the Boro stopper punch the ball away unconvincingly. Eastleigh could have fallen behind in the 11th minute. A long kick forward by Norris saw the ball bounce over Todd to allow Dave Tarpey a run down the left, into the area and a clean sight of goal. Tarpey got himself into a great position in behind the hosts defence but met his match in Jack Dovey, who stood strong to make an excellent and important save at his near post. Had this attempt gone in, it may have changed the complexion of the game but it was Eastleigh who responded well to take the lead and open the scoring. Just prior to Eastleigh breaking the deadlock, Reece Connolly picked up on a pass in the Eastleigh penalty area but miss-hit an attempt at goal that turned out to be an air-shot allowing the Spitfires to clear their lines. GLEN SOUTHAM ensured Farnborough were made to pay for these missed opportunities by taking the chance that came his way in the 13th minute. The Eastleigh captain rounded off a sweeping team move that saw Scannell run into the area before Reason took over the attack to play in Southam with a superb back heel. Glen controlled the ball before picking his spot to beat the keeper and find the net from close range. After the goal, Craig McAllister sent another header towards his own goal as the forward came back to defend a set piece but Jack Dovey showed safe hands to make the save. Eastleigh kept the ball well in spells and were stringing a good number of passes together on a difficult playing surface but it was Farnborough who next came close to scoring midway through the half. Jack Dovey was in fine form to deny Nic Ciardini who had wriggled his way into the Eastleigh penalty area with close control. Ciardini then struck a good effort that was heading for the bottom corner of goal only to see Dovey fly to his left hand side and save in style. A minute later, Reason teed up Southam for a strike at goal from 25-yards out. It was a powerful, well-struck effort from the skipper that whistled past opponents in front of him but was straight down the middle of goal allowing Jamie Norris to get his body behind the ball. The Spitfires had a chance to double their lead as Mark Hughes volleyed comfortably wide after Scannell's chipped cross into the middle. Farnborough then threatened from a free kick delivery and forced a corner but Eastleigh cleared their lines. Five minutes before the break a speculative effort from Dave Tarpey sailed a good ten yards high and wide of Dovey's goal. Meanwhile Eastleigh's Jai Reason came much closer as he spun his marker on the edge of the area and went for a first time shot that wasn't too far wide of the post. The first half came to a close with a low cross from Damian Scannell having to be hacked away inside the six-yard box to prevent McAllister a free shot at goal. 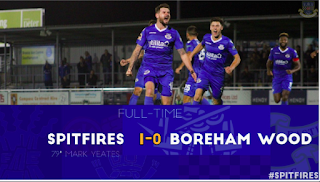 Glen Southam's early strike proved to be the difference at the break as Eastleigh led Farnborough by a single goal. Spencer Day's side could have scored a couple were it not for an impressive showing from Jack Dovey. After the break, the ball dropped for Jai Reason who, from just inside the Farnborough half, spotted the visiting goalkeeper off his line. Reason went for the ambitious only to drag his half volley comfortably wide from a long way out. The Eastleigh defence continued to look at ease in dealing with anything thrown at them as the impressive trio of Chris Todd, Dean Beckwith, and man of the match for the second game running – young Alex Lacey all made a lot of interceptions and played the ball out of defence on the ground. Neat football from Eastleigh in the 56th minute saw the Spitfires play their way forward out of defence. The move eventually resulted in Damian Scannell crossing the ball low from the right for Craig McAllister, who scooped his effort over the bar. Just past the hour mark a good free kick from Jai Reason was curled into a crowded Farnborough penalty area but headed clear. The action went straight up the other end as Eastleigh survived a scare of possibly conceding a penalty after shouts for hand ball. 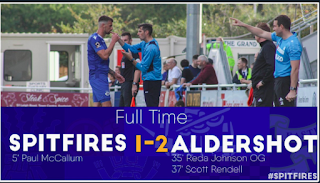 With the game still firmly in the balance despite Eastleigh's slender lead, Reason skipped past Inman but saw his run halted by a perfectly-timed challenge from Alan Inns in the 67th minute. Suddenly Farnborough found themselves right back in the game and on level terms. A quickly taken free kick evaded everyone, and for the first time in the game caught the Spitfires napping, which allowed DAN BENNETT to sneak in unmarked at the back post to tap into the net past the helpless Dovey. 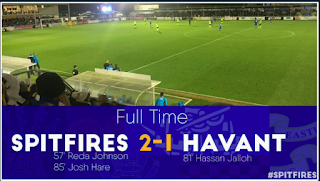 Thankfully for Eastleigh, and to their credit after conceding, Richard Hill's side hit back with the best response possible by restoring their lead within the space of a minute or two. CHRIS TODD rose highest in the centre of the Farnborough penalty area to despatch a good delivery into the box past the goalkeeper. It was a bullet header and an excellent debut goal for Todd. In the 72nd minute Scott Donnolley had a good opportunity to hit back for the visitors with a free kick from just outside the area but curled it wide of the target from a decent position. Dale Binns came on to replace Glen Southam, who limped out of the action, in the 78th minute. Within a few minutes Binns had a good chance to shoot from the left side of the area but opted to hold the ball up allowing players to get back into position - and passed to Reason whose effort went wide of the post. An excellent burst of pace from Scannell in the 85th minute saw the forward out-sprint his marker down the left hand side where he played a lovely cross in to the box. The delivery was sent into the perfect area and narrowly missed the foot of Reason who did his best to get on the end of it at the back stick. Eastleigh leader, former captain, terrific servant and all-round genuinely nice guy Tom Jordan was sent on for what is believed to have been his farewell appearance for the club. Jordan came on in the 89th minute for Craig McAllister, and almost instantly the referee indicated that there would be a minimum of five minutes of stoppage time to add on. Jordan went up front and showed some classy touches in his cameo including a drag back and back-heel down the touch line for Scannell to run on to. It was only fitting that Tom should play a part in Eastleigh's third goal of the game, the goal that made certain Eastleigh would claim all three points today over Farnborough. A neat exchange of passes between Scannell and Jordan down the right resulted in DALE BINNS chesting down Scannell's cross before promptly finding the net with a precise finish into the corner of goal. Just before Binns had wrapped up the win to make it 3-1, the lively Scannell fizzed a shot narrowly wide with an effort on his left foot. Today's victory meant back to back home league wins for Eastleigh in another strong team showing at the Silverlake Stadium. Here's hoping we can continue these type of performances on the road going forwards.